Flags in cycling. A not-so-exhaustive list of flags that make you go "hmmm". There are many unexpected side effects to being a cycling fan. One is that at some point in your life, you'll probably tell friends and family about the amount of calories that riders consume during the Tour de France. You will do this with great pride, as though you were the one needing to eat forty eight pounds of mashed potatoes and rice everyday. Yet another unusual side effect of following cycling is that if you watch enough races, you'll end up being exposed to small bits of information about countries other than your own. As a kid I watched the Tour and the Vuelta, and it was then that I became aware of the Basque Country, as well as its flag/s and inherent political struggles. There were other flags at races which I didn't recognize, and looking into each one unlocked a small set of facts about a region I previously knew nothing about. There were separatist groups, good bits of history, and fights for independence, which all led to my inevitable trip to a world map, to see where in Europe each country or region was actually located. All this came about simply from seeing flags on the side of the road, or painted along the race route. Due to my fond memories of watching races as a kid, I thought I'd revisit some of the flags that captivated my imagination back then. Ones that perhaps still have the same effects on young and old alike as they too watch races like the Tour de France, and wonder what one flag or another represents. In compiling this not-so-exhaustive list, I've opted to skip primary national flags, choosing instead to highlight those that had me squinting when I was a kid. Now, I willingly admit that I know little about vexillology, or European history at large, so please feel free to add information through comments. It's also worth mentioning that some of these symbols are tied to serious and sometimes ongoing political struggles. As such, I share these with you in the spirit of curiosity alone, as you too may have seen these along race routes, and wondered what they were. Yes ladies and gentlemen...while other sites give in depth analysis of races, ongoing commentary about doping cases, or hilarious insight into the world of cycling at large...Cycling Inquisition is posting about flags (and referencing both Arsenio Hall and a C+C Music Factory song in the title). This is exactly why I continue to have tens of readers on a yearly basis. Is this a weird black and white version of the US flag? No, it's Brittany's flag...but there's a reason for the similarity so don't feel bad for thinking the two are related. Brittany is a region in northwestern France, which is the birthplace of Bernard Hinault. Brittany got its flag in 1923, when it was designed by Morvan Marchal. Marchal used the flags of both the United States and Greece for inspiration, hence the similarity. Today, it's one of the more visible flags in the Tour, especially when it visits that part of France. It's worth noting that at one point, this flag was considered to be a separatist symbol, but that is (to my knowledge) no longer the case. This flag, admittedly, was the first one to catch my attention as a kid. It's called the Ikurrina flag, and it's the official symbol of the Basque Country (an autonomous regions in northern Spain). Designed by founders of the EAJ-PNV (Basque Nationalist Party), it's also often used in the French Basque Country. The flag was prohibited under the Franco regime, when it became a symbol of defiance as members of the ETA began placing it in public places. Once upon a time, when I played drums in a band that I was in with my brother, we had the chance to tour through Europe, and played in San Sebastian (which is in the Basque Country). In retrospect, I have to admit some ignorance, since I didn't even know where I was that day, as we walked into the hall where we'd be playing. I was told we were still in Spain, so I walked up to the drummer in the opening band, introduced myself (in Spanish) and kindly asked if I could use his cymbals that night. He looked at me angrily, and responded in a language I could not understand (but would probably sound to cycling fans like a series of last names from the Euskaltel-Euskadi roster). I shrugged and smiled, to indicate that I didn't understand him. He paused, took a deep breath, and in perfect Spaniard Spanish said, "You are not in Spain, you are in the Basque Country. Never assume that we speak Spanish." Lesson learned. We got along famously for the rest of the night, and had a fantastic time playing for a packed house. But to this day, I think about that exchange when I watch the Clasica San Sebastian every year (or as Basques refer to it, Donostia-Donostia Klasikoa, since the town is called Donostia in the Basque language). I've always tried to be respectful of the places I visit, but I simply get caught off guard from time to time. Does it really say "pre-soak?" Hmmm. Like the ikurrina flag, the one above is usually seen around the Basque Country, and most notably in stages around the Pyrenees. It's flown in support of ETA members who are imprisoned in Spain and France, and asks for their transfer back to the Basque Country. 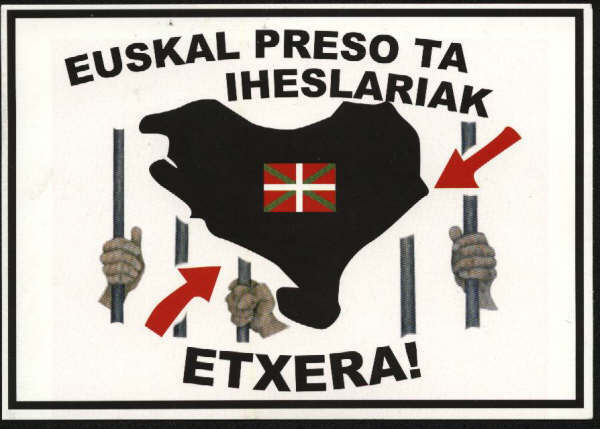 There are slight variations, but the text most often reads as it does in the image above, which means "Basque prisoners to the Basque Country"...so no, it has nothing to do with the pre-soak cycle in your dishwasher. Perhaps one of the best-known flags within cycling, the flag of Flanders has significant political meaning that many fans outside of Europe appear not to know about. Over my last two visits to Flanders, I've been told by several people that the flag above (which depicts a fully black lion, versus the official one that shows it with red claws and tongue), can be perceived as "anti-Belgian", and states that the owner supports a free or independent Flanders. Some also told me that it's a symbol for many in the radical right. One Flandrian host, however, was quick to point out that during the spring classics, the meaning of the purely black lion is perhaps put aside, as many visitors now see it as simply a symbol of Belgian cycling. Be that as it may, you should be aware of such implications. 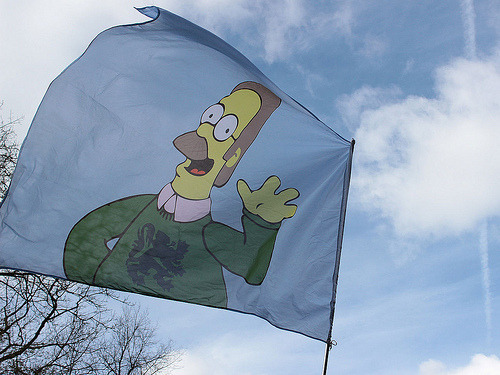 You may have seen flags featuring Ned Flanders (of the Simpsons) at some races (see here and here). It's worth mentioning that this joke seems to be lost on most Flandrians. At least ones I've spoken to. In Flemish, "Flanders" (the region) is "Vlaanderen", and apparently the character on the TV show remains "Flanders" for them...so they eventually saw the humor in it, but the connection between the two terms is not automatic. Prominently seen during the first week of this year's Tour, the flag of Wallonia features the Walloon Roster, which serves as the official emblem of both Wallonia (French-speaking region in Southern Belgium), and often the French community within Belgium as well. The colors from the flag are derived from the city of Liege. It's worth noting that the flag was also used by the Walloon Movement. Proposed by the Lega Nord political party, this flag represents the Padenia region in Northern Italy. In the 1990s, the Lega Nord proposed that the name Padenia be used for a fully autonomous Northern Italy. It's for that reason that you'll most often see this flag in Italian races. In the spirit of full disclosure, I should tell you that I recently referred to this flag in a conversation with my brother as "the one that looks a bit like the Herbalife logo". Not as commonly seen during this year's Tour due to the absence of Andy Schleck (and the fact that his brother Frank has been napping through much of the race), the flag above is based on the Coat of arms of Luxembourg. It's most often used when trying to avoid confusion with the flag of the Netherlands (like at the Tour), and was proposed as a new national flag in 2006 through a legislative proposition. The legislation, however, was not approved. It's worth noting that the Luxembourg province in Belgium (yes, a province with the same name as the nearby country) widely uses a similar flag as its unofficial symbol. The flag above is for the Isle of Man, the birthplace of Mark Cavendish. Much in the way that the alternate flag for Luxembourg serves as a symbol of Schelck fans in cycling, this one is big with Cavendish fans. The flag became official in 1931, and features a triskelion on a red background. Though somewhat similar, it should not be confused with the flag of Sicily, which also features a triskelion, and can be seen in some cycling races. Now we get a bit more obscure. Sometimes seen at the Giro, my brother reminded me of this one, the flag of Sardinia. Sardinia is an autonomous region of Italy in the Mediterranean, and its flag is known as the Four Moors Flag, since it features...well...four Moops. Originally, the flag featured the figures facing to the left, with their eyes covered. Now, they face right, and the bandage that covered their eyes now rests on their forehead. Those who watch the Vuelta may recognize this one, which is from Asturias, a principality in Spain, next to the Basque Country. The flag was used in the Battle of Covadonga in 722 against the Moors/ Moops. Fans of the sport will remember that it was in the Lagos De Covadonga climb that Colombian Lucho Herrera pretty much won the Vuelta in 1987. Often seen in Vuelta a España: the Catalan Flag (from the Catalan region, which contains Barcelona) and a variant that includes a blue triangle and white star (inspired by the Cuban flag, and used by those who want a separate Catalan state). The Spanish flag with a bull superimposed (usually preferred by those in Madrid or surrounding regions). Also worth mentioning (since they are often seen at races) are all the regional flags from France, Welsh flag, and the North Brabant flag (thanks to Mike for letting me know about that one). Tough not often seen on the side of the road, you may have wondered why the Australian national champion's jersey uses a green/yellow color scheme (as opposed to the Australian flag we all know). If you want know why, you can read about it here. If Australian readers of the blog have any more information, feel free to add it in the comments section. Though not really a flag, more of a banner, the Tornado Tom Frites guy appears to be everywhere during Belgian races. I believe there are actually several banners, some of which are signed by riders (maybe just Tom Boonen again and again). I stood close to one of these banners in Roubaix, and foolishly failed to ask the owner some questions. I'll try next time. In case you don't know, "Tornado" is Tom Boonen's nickname, and "Frites" are what Americans call french fries and and most other english speakers call chips. Lastly, Mike from Gage & DeSoto suggested I include one other entry into this list. After all, what would a list of symbols of any kind at cycling races be without a mention of Dirk Hofman Motorhomes? 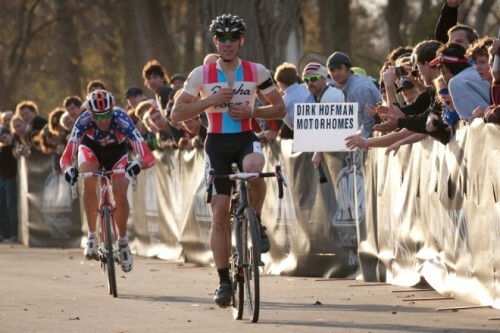 Though also not a flag, the Dirk Hofman company has been getting free advertisement at races for many years by inserting signs within the crowd at the right time. The signs have become so popular, that they've even spawned t-shirts and copycat signs at US races. As you'd expect, Dirk Hofman Motorhomes was/is a business that rents motorhomes in Europe (Belgium I believe). Not long ago, I found a website and an address for the business, but it appears to be down now. Have we seen the last of Dirk Hofman and his sign armada? Let's hope not, so let's keep our eyes open during the spring classics next year. If you want to determine if the a fan on the side of the road is cheering for a Colombian or Venezuelan rider, remember to look for the stars. The Colombian and Venezuelan flag are the same (with Ecuador almost being identical as well), but Venezuela's has an arc of stars in its blue band. Have I missed some that you've wondered about?